In 2011 Martin Boles joined Herzog & de Meuron in Basel, Pritzker Prize Laureates from 2001, as a tranee. He has been part of a team working on a project of Cultural Complex in São Paulo. As part of a smaller group, he worked on a design of performance spaces. Cultural Complex Luz will be an important addition to Latin America’s largest cultural district. By combining education, culture, arts and events, it aims to bring enhancements to the surrounding neighborhood as well to bring together dance and music, students and professionals, performers and audience, production and rehearsal in one place. 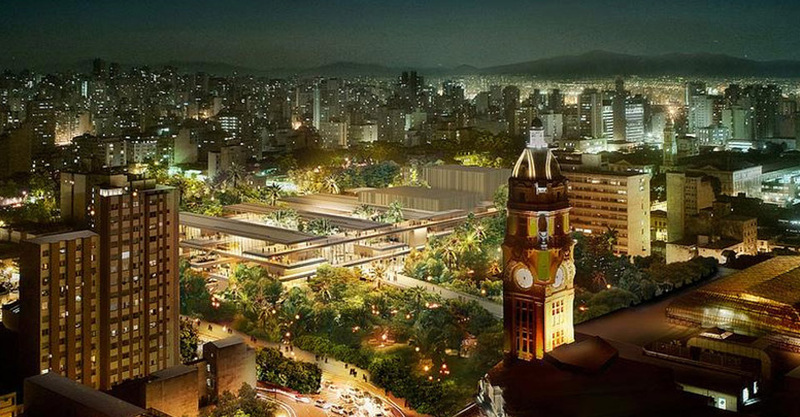 As the home for the São Paulo Dance Company and the 2000-student Tom Jobim Music School, the complex will include a 1750-seat Dance Theater, a 500-seat Recital Hall, and a flexible Experimental Theater with up to 400 seats. To enhance the planned uses and mix of uses, and create greater variation of spaces, the building consists of interwoven horizontal bands which cross at split levels. These wide, linear bands act like city streets to allow for dynamic and diverse exchanges. The main entrance is provided by the Grand Ramp, which is simply one of the slabs projecting out and sloping down into the grounds. It enters directly in the heart of the Complex, and is the main orientation and distribution device in the building. The landscape of water and green plants creates tropical planting forms a dense green carpet, grows around the slabs.